OUR WALKS are led by specialists or well schooled naturalists, and provide a good way to expand your knowledge of local natural history as well as to mingle with members of the natural history community. Brad Armstrong and Doug van Hemessen led HFN participants into the Nature Conservancy of Canada’s Deep Cove Nature Reserve on Oct 24, 2015. OUR TALKS are given by both experts and interested amateurs – one every month except during the summer. They provide an opportunity to learn what local scientists, volunteers, and HFN members are up to. Regular meetings with talks are held on the first Thursday of every month except July and August at 7:30 PM in the auditorium of the Nova Scotia Museum of Natural History, 1747 Summer Street, Halifax. Meetings are open to the public. Use the entrance next to the parking lot. There is a charge for parking at the Museum; usually, two hours will be adequate. In partnership with the Nature Conservancy of Canada (NCC), we are going to visit the backlands behind Williams Lake, exploring a few lesser known trails. The backlands will become a wilderness park managed by the NCC and HRM. On the walk back out, we will come by a former camping site, and take out as much of the garbage left behind. Beside your regular walking gear, please bring a pair of gloves and a bag of a size you are comfortable carrying out for 15 minutes. Location: Meet at the bus stop on Purcell’s Cove Road that is across Melvin Dr. (approx. 5 km from Armdale roundabout). Metro transit route 15 serves the bus stop. Diane LeBlanc will lead this field trip along established gravel, boardwalk, and forest paths at Crystal Crescent Provincial Park. Diane has been birding the park for several years and has observed over 125 species at this location. April is early migration and an excellent time for birding here – 66 different species have been observed over the past four years (eBird). Long-tailed Ducks, Common Goldeneye, Common Loons, Red-breasted Mergansers, various Scoters, and Harlequin Ducks can often be seen and heard just offshore. One or more birds of prey, such as Bald Eagle, Northern Harrier, or Merlin, may make a brief appearance. Chickadees can be found year-round at the park, though the Black-capped Chickadees far outnumber their Boreal cousins. One or more sparrow species are likely to be foraging on the bushes and beaches and the odd shorebird or warbler may be found passing through at this time of the year. One never knows what one will see outside — it is possible to spend two hours at this location observe only a few gulls, but the walk provides beautiful views of the ocean and beaches. The gate to the park will be closed so the walk will begin at the drive to the beach. The route includes Cootes Cove (1st and 2nd Beach) and Mackerel Cove (3rd Beach). It is commonly colder and windier at Crystal Crescent than even a kilometre inland and the walk can be warming, so dress in layers with warm and comfortable footwear. There will be a maximum of 20 participants. Please register in advance. Location: Meet at the entrance to Pennant Point Provincial Park in Sambro. Difficulty: Moderate, there are a few stairs and hills but the paths are well trodden. Michelle McPherson has an M.Sc in Biology from Acadia University. Her business, McPherson Conservation, delivers workshops on hobby natural beekeeping education and hive mentorships for beekeepers, as well as specialty workshops on ecology and conservation biology. Michelle will talk about the amazing diversity of wild bees that live in Nova Scotia, and why they need our attention. She will introduce us to some of these beautiful insects, and show how to create bee habitat on our own property. She will share her passion about honey bees and everything they connect to: ecological service, food security, insect biology, agricultural landscapes, and natural medicine. Her true vocation is to get people excited about our wild bees, and how to support and create more habitat for them in our gardens, public spaces, and landscapes. She is a local, Natural Beekeeper going into her 8th season with eight hives in Cole Harbour, two of which live at the Cole Harbour Heritage Farm Museum. She also raises and sells honeybees. 7:30 p.m. at the NS Museum of Natural History (lower entrance). Join Geological Survey of Canada Research Scientist, Dr. Michael Parsons, and recent Saint Mary’s University graduate, Molly LeBlanc, for a tour of historical mine workings and associated mine waste deposits at Montague Gold Mines. Gold was first discovered at Montague in 1862 and mining and milling of gold ore took place intermittently until 1940. During that time, gold was recovered using mercury amalgamation and cyanidation, and mine wastes were discharged into local streams and wetlands. Unfortunately, the mine wastes at this site are now located close to residential properties and are frequently used by off-road vehicles. 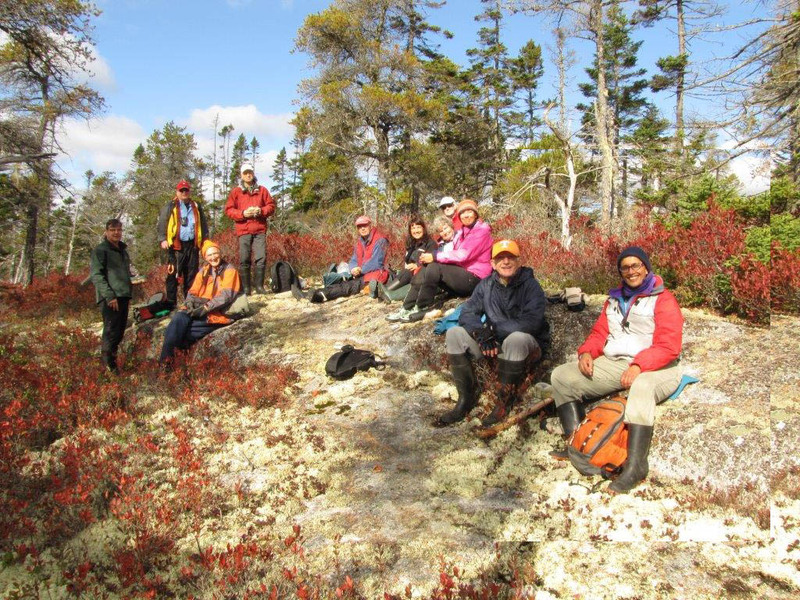 This tour will provide an overview of scientific studies of this site, which have led to a recent decision by the Province of Nova Scotia to develop long-term closure plans to reduce risks to human and ecological health. Time/Place: 10 A.M. Meet at the very end of Montague Mines Rd (off Montague Rd) near civic address 183, Dartmouth.